Are you currently preparing to start a construction project that will include the use of cranes and other heavy-duty equipment? Ritter Forest Products can help you keep your job site safe by providing you with crane mat sales and rentals in Ohio. In addition, we also carry a selection of quality-grade laminated and timber mats, pipeline skids, shoring material and more to ensure that your valuable equipment, employees and the structures surrounding your job site all remain safe. 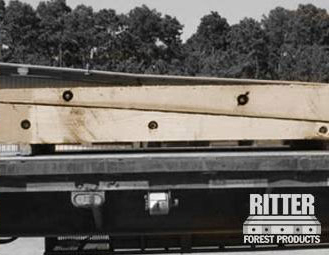 While Ritter Forest Products can provide you with standard-size crane mat sales and rentals, we can also set you up with a custom mats and timbers to fit any piece of equipment. Regardless of whether you are simply working with machinery outside of the 12’-30’ range or need custom mats and timbers to mimic an obscure shape, we can handle it for you. Just let us know the dimensions, and we will get it into production. In order to protect your expensive equipment and those operating it, you should never work a construction site without quality crane mats in Ohio. These mats can prevent your equipment from sliding around and causing a job site accident due to soft, unstable ground. Ritter Forest Products manufactures crane mats in Ohio using oak timbers and mixed hardwoods that will provide you with the added security you truly need. If you choose to use a crane or another piece of equipment without timber mats, you could be putting yourself and your team at risk. Rather than taking a chance, let Ritter Forest Products provide you with durable timber mats here in Ohio. Our mats are built to sustain just about anything, and once they are firmly in place, you won’t have to worry using your equipment on an unstable surface. Ritter Forest Products proudly offers high-grade laminated mats in Ohio for those construction companies that can’t afford to stop work just because poor weather has softened the ground. Laminated mats are built with the same high-grade materials as our other mats, making them strong and dependable, but a big advantage they offer is that they are extremely maneuverable, as well. Move your laminated mats wherever you need to and keep your project rolling at all times. You can utilize the 3-ply laminated mats from Ritter Forest Products to create temporary roads and stable platforms, or to provide site protection during your next job. They are made using 2×8’s and are perfect for those who have lighter load demands. Our 3-ply laminated mats are available in 12’, 14’, and 16’ lengths and are very lightweight, making them easy to move around to wherever they are most needed. Do you want to provide even more support for your heavy equipment? You can do it with outrigging pads from Ritter Forest Products. They are made using oak or hardwood timbers and ensure that your equipment is more balanced and stable, regardless of the condition of the surface below them. 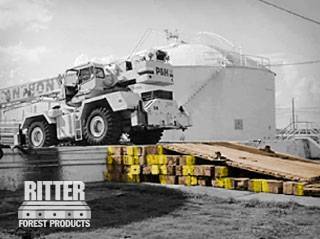 Additionally, Ritter Forest Products carries transition mats that can be angled up from 3” to 12” and utilized to move heavy equipment from the ground level onto an elevated pad. When you’re building a pipeline, you need to use pipeline skids along the way to crib, rack, and elevate your pipe. Ritter Forest Products can make this possible by offering pipeline skids and timbers for sale and rent. Not only do these products aid in protecting the landscape surrounding your job site, but they also help to ensure your equipment is not damaged when being transported through often unpredictable terrain. In addition to keeping your equipment stable on a job site, you also want to stabilize any structures you put up that might not be sturdy enough to stand on their own yet. With Ohio shoring and cribbing material, you can secure a structure from all angles and make sure it stays upright. 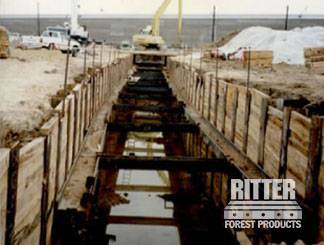 Ritter Forest Products can provide options for precut shoring materials or can customize your lumber cut based on custom measurements. 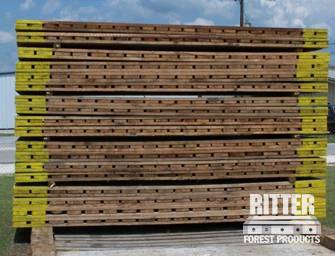 Whether you are looking for Ohio crane and timber mat rentals or are in need of a pipeline skid for sale, Ritter Forest Products has you covered. Get in contact with us today to learn more about our complete product line.